Artist’s conception of two extrasolar moons orbiting a giant gaseous planet. Astronomers have their fingers crossed that within the haul of data collected by NASA's Kepler mission, which has already detected nearly 3,000 possible exoplanets, hide the signatures of the very first exomoons. Because exomoons orbit a larger planetary body, they have an additional set of constraints on their potential livability than exoplanets themselves. Examples include eclipses by their host planet, as well as reflected sunlight and heat emissions. Most of all, gravitationally induced tidal heating by a host planet can dramatically impact a moon's climate and geology. Heller and Barnes have proposed a circumplanetary "habitable edge," similar to the well-established circumstellar "habitable zone." This zone is the temperature band around a star within which water neither boils off nor freezes away on a planet's surface — not too hot, not too cold, thus earning it the nickname "the Goldilocks zone." The habitable edge is rather different. It is defined as the innermost circumplanetary orbit in which an exomoon will not undergo what is known as a runaway greenhouse effect. "To be habitable, moons must orbit their planets outside of the habitable edge," Heller said. A runaway greenhouse effect occurs when a planet’s or moon's climate warms inexorably due to positive feedback loops. This phenomenon is thought to have taken place on Earth's so-called "sister planet," Venus. "Typically, and especially in the solar system, stellar illumination is by far the greatest source of energy on a moon," Heller said. "In wide planetary orbits, moons will be fed almost entirely by stellar input. But if a satellite orbits its host planet very closely, then the planet's stellar reflection, its own thermal emission, eclipses and tidal heating in the moon can become substantial." This "planetshine" can add a not-insubstantial amount of energy to an exomoon's overall intake. Imagine a gas giant planet orbiting a sun-like star at about the same distance that Earth orbits our sun. For a moon with a relatively close orbit around this planet, like Io’s orbit around Jupiter, Heller calculates that the moon could absorb an additional seven or so watts per square meter of power. (Earth absorbs about 240 watts per square meter from the sun). Interestingly, because most moons (including ours) are tidally locked to their planet — that is, one side of the moon constantly faces the planet — eclipses, as well as planetshine, would only darken and lighten one hemisphere. This phenomenon could modify the climate, as well as the behavior of life forms, in ways not seen on Earth. However, this situation introduces another hurdle to habitability: The closer a planet is to its star, the stronger the star's gravitational pull is on the planet's moons. This extra pull can tug moons into non-circular, or eccentric, orbitsabout their planets. Eccentric orbits, in turn, result in varying amounts of gravitational stress exerted on the moon as it orbits. These “tidal forces,” as they are called, cause heating due to friction. The ocean tides we experience on Earth occur partly as a result of the moon's gravity tugging more on the water and land nearest it, which distorts Earth's shape. The effect goes both ways, of course, but not equally, with planets inducing significantly greater tidal heating within their much smaller moons. 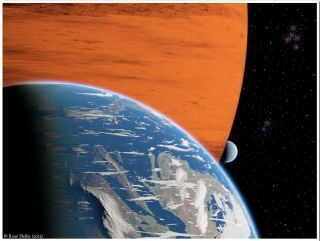 If an exomoon's orbit takes it too close to its planet, tidal heating could push the energy budget too high, culminating in a runaway greenhouse effect. At the extremes, the tidal heating could unleash massive volcanic activity, leaving the satellite covered in magma and distinctly inhospitable, like the "pizza moon" Io. Another factor comes into play as eclipses rob a bit of energy from an exomoon and require the moon-planet pair to be closer to their star. To remain gravitationally bound to a planet and not be ripped away by the star's gravity, a moon must fall within a so-called “Hill radius” — the planet's sphere of gravitational dominance. This radius shrinks with greater proximity to the host star. The closer the planet and moon are to their star, the less space is available outside the habitable edge. For planets and attendant moons around dim, cool, low-mass stars called red dwarfs, this dynamic becomes important. The habitable zone around red dwarf stars is very tight; for a star with a quarter of the sun's mass, for instance, the Goldilocks zone is thought to be around just 13 percent the sun-Earth distance – in other words, a third of Mercury's orbital distance from the sun. In a red dwarf solar system, not only must a moon then be closer to its habitable zone planet, but given the planet's necessary proximity to its star, the moon's orbit will tend to be eccentric. These qualities increase the chances that the moon will fall within the habitable edge. "There is a critical stellar mass limit below which no habitable moon can exist," Heller said. "Around low-mass stars with masses of about 20 percent the mass of the sun, a moon must be so close to its habitable zone planet to remain gravitationally bound that it is subject to intense tidal heating and cannot under any circumstances be habitable." Many factors beyond habitable edge considerations, of course, ultimately determine an exomoon's habitability. To be considered broadly habitable by creatures other than, say, subsurface bacteria, an exomoon must meet some of the same basic criteria as a habitable, Earth-like exoplanet: It must have liquid surface water, a long-lived substantial atmosphere and a magnetic field to protect it from solar radiation (and, in the case of exomoons around gas giants like Jupiter, from the charged particles created in the giant exoplanet's magnetosphere). To possess these qualities, which scientists say grow likelier with increasing mass, a habitable exomoon will likely be quite large compared to those in the solar system – more on the order of the size of Earth itself. The biggest moon in our solar system, Jupiter's Ganymede, is just 2.5 percent of Earth's mass. But previous studies have suggested that monstrous moons by the solar system's standards are indeed possible. NASA's Kepler mission is expected to be able to detect exomoons down to about 20 percent of the mass of the Earth. The data, which consists of measuring the extremely small dips in the amount of starlight as their planets (or moons) block it from our point of view – should reveal a moon’s mass and orbital parameters as well. Armed with this information — and now with habitable edge considerations — astronomers can thus hope to make some ballpark speculations on any soon-to-be-discovered exomoon’s propensity to support living beings. Heller hopes that there will be a list of candidate exomoons ready for observing by next-generation instruments, such as NASA's James Webb Space Telescope and various 30-meter-class ground telescopes. These observatories, coming online in the next decade, could be able to characterize exomoon atmospheres and offer tantalizing evidence of life. "The first exomoons that we find will be large — maybe Mars- or even Earth-sized — and therefore intrinsically more likely to be habitable than small moons," Heller said. "With Kepler finding many more giant planets than terrestrial planets in stellar habitable zones, it's really important that we try to figure out what conditions might be like on the moons of these giants to gauge if they can host extraterrestrial life."